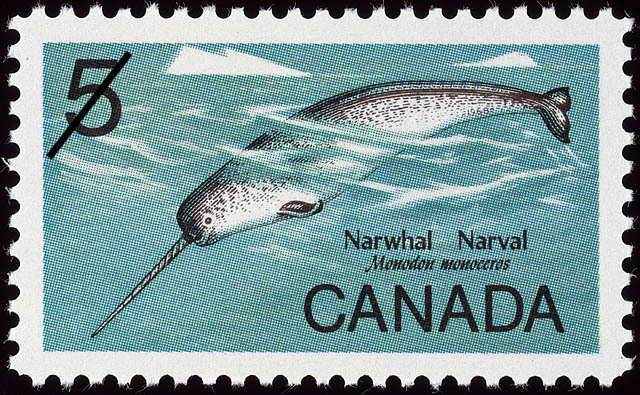 The value of a Narwhal, Monodon monoceros - 5 cents 1968 stamp depends on several factors such as quality and wear, supply and demand, rarity, finish and more. Values in the section are based on the market, trends, auctions and recognized books, publications and catalogs. This section also includes information on errors and varieties and characteristics. The Narwhal, a comparatively little known mammal of the arctic seas, has been chosen by the Canada Post Office as the theme for a continuation of a Wildlife series of stamps initiated in earlier years. The Narwhal (Monodon monoceros), or sea unicorn as it was known to the early explorers, is a small whale rarely exceeding 16 feet in length which is confined to the arctic seas. Though it is found in the Arctic Ocean as far as 85°N, and about Franz Josef Land and northeastern Greenland, its true home is in the waters of Baffin Bay. It owes its name, corpse whale in old Norse, to its curious colouration: slate blue in new-born young, becoming flecked with intense white patches and splashes, until in old age most of the lower half is pure white in colour. The most remarkable characteristic of the narwhal is the enormously elongated tusk which develops in the upper left jaw of the male. In older animals it may obtain an external length of more than seven feet and measure 3 to 4 inches in diameter at the base. The surface of the tusk is marked by a series of spiral ridges which twist counterclockwise from root to tip. Normally the right tooth never grows longer than about 9 inches and remains embedded in the skull, but many museum specimens, taken as curiosities, have both tusks present. Females, normally tuskless, may also develop one or both teeth. Tusks are hollow, almost to the tip and are often broken or abraded. The do not appear to be used in fighting since few wounds are found on narwhal skins. They appear to function only as secondary sexual adornments on the male. For most of the year the narwhal feeds over deep water on squids, but during and after break-up of the fast ice it comes close to the land where the shore line is steep. It feeds on polar cod, bottom-living crustaces and Greenland halibut. In arctic Canada, narwhals are mainly confined to the north and east coasts of Baffin Island and the Repulse Bay area in northern Hudson Bay. The Eskimos hunt them as they come into the leads of open water at breakup, and later in the summer they pursue them in small open boats. Since the adults weigh as much as two tons, they form an important source of meat and blubber for the Eskimos and their dogs. Highly prized is the skin or muktuk which is eaten raw. It has a rubbery texture and has a not unpleasant taste, suggestive of hazel nuts. It is rich in Vitamin C. Narwhals are shy but gregarious animals and are often seen in schools numbering several thousand. Though evidently not as numerous as the larger species of whales, they are protected from over-exploitation by the sheer inaccessibility of their environment. The artist John A. Crosby, of Ottawa made his debut as a designer of Canadian stamps in 1953 when his submission was selected for use on a Polar Bear issue.